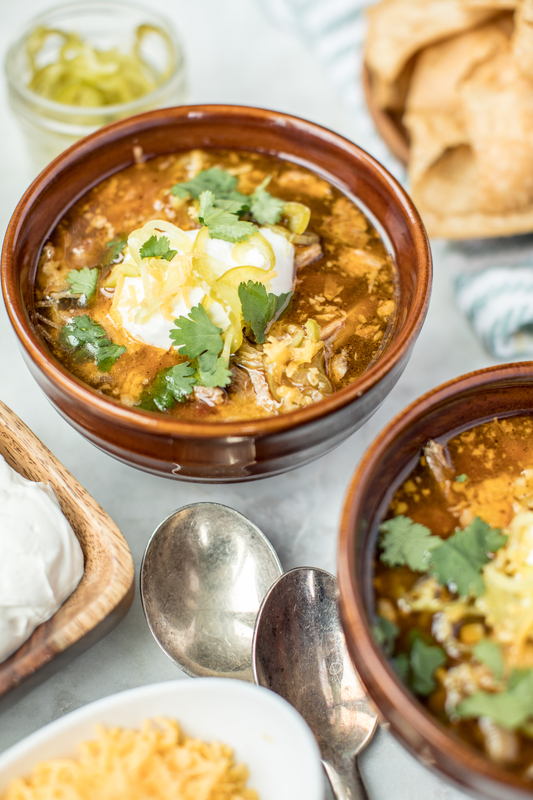 Part chili, part yummy stew, this pork shoulder chili is perfect for game day or just any chilly Chicago day! 3 cups of your favorite mix of beans, we used black beans, kidney beans and cannellini beans. Blend spice mix into a powder. Season pork shoulder liberally with 3/4 of the mix and 2 tablespoons salt and a sprinkle of pepper. Toss onions in a splash of oil and remaining spice mix. Set aside. Heat a saute pan over medium high heat, with a splash of oil. Sear pork on all sides and transfer to a crock pot with remaining ingredients. Cook for 6-8 hours, until fork tender and shreddable. Take the meat out and discard the bone. Pull the meat apart until it is shredded. Put the meat back into the broth and add and the beans. Simmer for a few minutes, until the beans absorb some of the flavor and are warmed through. To serve top with sour cream, shredded cheddar cheese and tortilla chips on the side!